The Northwest Guilford Vikings won their second consecutive HAECO Invitational girls’ basketball tournament with a 47-32 win over the Page Pirates. Viking senior Hayley Barber won her second consecutive MVP award while also being named to the All-Tournament team. Barber and Morgan Pointer both scored 11 points apiece to lead their team to victory. Pointer also had a team-high 11 rebounds. 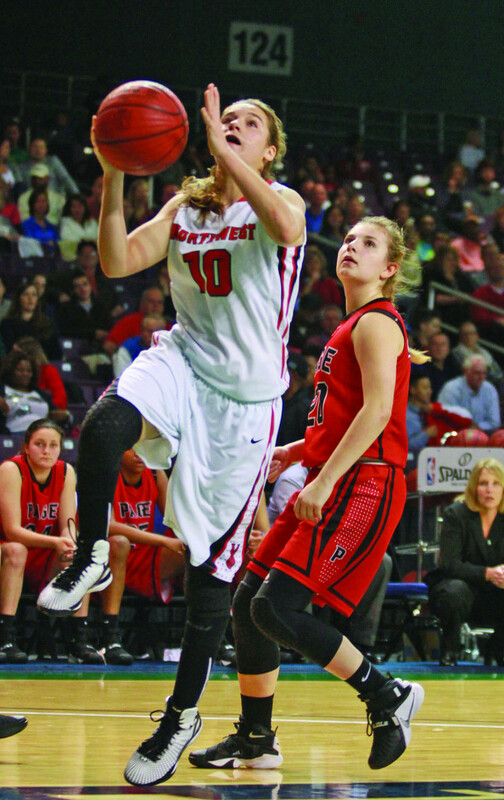 Northwest began pulling away from Page in the third quarter with a 27-17 lead. The Vikings outscored the Pirates 16-5, erasing any come back hopes. Cayla King, a freshman Northwest guard, was selected to the All-Tournament team along with Bailey Kargo, senior guard for Page, who scored 19 points. The Greensboro Day School (GDS) Bengals captured their fifth consecutive HAECO Invitational boys’ basketball tournament with a convincing 81-60 victory over Northwest Guilford Tuesday night at the Greensboro Coliseum Special Events Center. The Bengals featured a balanced scoring attack led by HAECO MVP sophomore Jaquar Moorman who netted 19 points and 14 rebounds. Greensboro Day junior guard Travon Mayo contributed 16 points while Will Dillard, Jordan Perkins and Soloman Smith added 12 points each. The Bengals led 39-18 at the half before the Vikings staged a mild comeback, getting within eight points (46-38) before GDS pulled away. Sophomore guard Tre Turner led the Vikings with 20 points. This season, the Greensboro Day boys’ basketball team, guided by coach Freddy Johnson, returns all five starters consisting of three sophomores and two juniors.